Many visitors already know and frequent Dongdaemun Market, a shopping mecca for anyone interested in local fashion, or Namdaemun Market, where hundreds and thousands of residents flock every day. 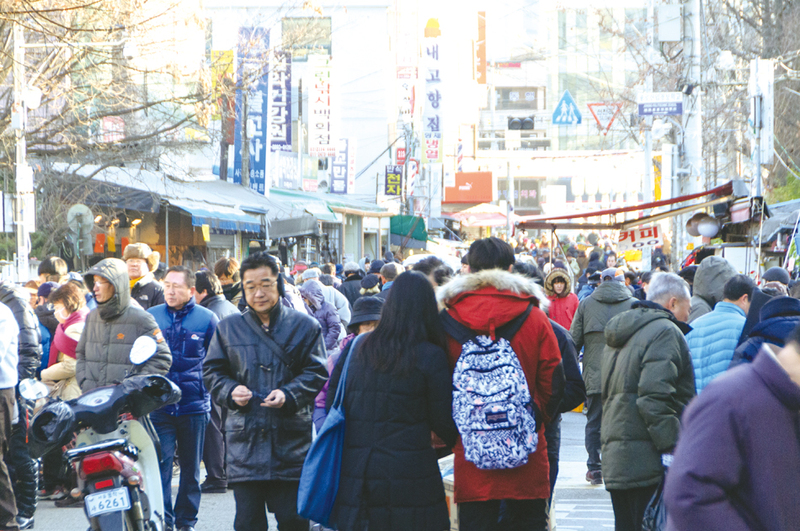 Although smaller in size, Seoul Jungang Market used to rival the other two markets in prominence and was the center of wholesale buying in the ‘70s, housing almost 80 percent of the total grain trade in Seoul at the time. The market began to stagnate, however, when retail stores and department complexes started popping up nearby. 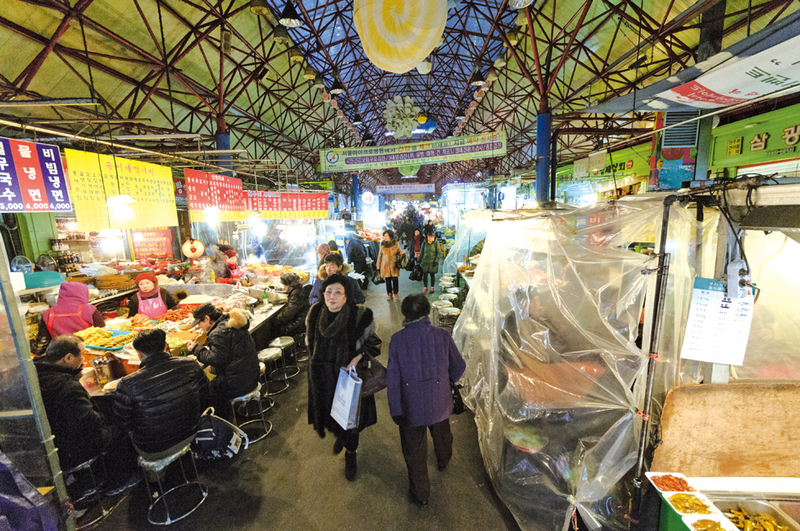 A 2004 renovation was designed to update the facilities and make the space easier to navigate, and these days the market boasts more than 1,000 vendors and has become one of the biggest dried seafood markets in Korea. 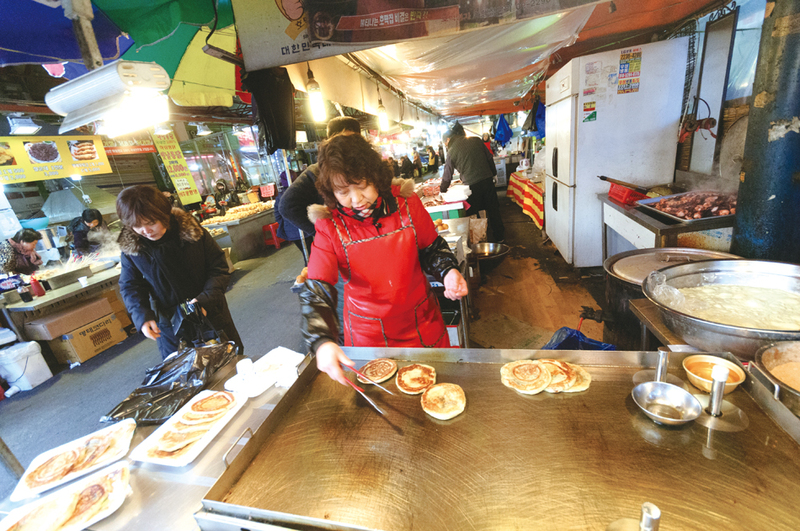 Head to the Seoul Jungang Market to try some of the country’s best anchovies, squid and dried pollack, and be sure to check out the market’s assortment of snack carts and other vendors that sell vegetables, rice cakes, bread and meat of all kinds. Some of the food stalls stay open till late at night, but plan on being there early since most stands close early in the afternoon. EAT> You can find almost anything to eat around the market in the food stalls and snack carts that sell mouth-watering goodies. Look near the entrance of the market for vendors that sell hotteok, a sweet Korean pancake, or jokbal, pig trotters. You can also find fresh raw fish at the market that is sold at a very good price. Shindang-dong Tteokbokki Street is in vicinity as well, so visit Shingdang-dong Tteokbokki (T. 02-2233-1559) if you are craving some tteokbokki, or stir-fried rice cakes. DO> Walk around the market and soak in the bustle of Seoul. Make sure to pass through the Sindang Creative Arcade (T. 02-2232-8833), where some of the market’s empty stalls have been reinvented to serve as studios and a gallery for local artists. GO> Sindang Station 신당역 (Line 2 or 6), Exit 2. Make a U-turn at Exit 2, walk about 200m and you should be at the entrance of the market. Deoksugung Palace served as a royal residential palace when most of the other palaces in the country had been burned down during the Imjin War (1592-1598). As a result of this history, the palace served as a royal court for Kings Seonjo (r. 1567-1608) and Gwanghaegun (r. 1608-1623) and Emperors Gojong (r. 1863-1907) and Sunjong (r. 1907-1910). It is especially admired for incorporating both Western and Korean architecture, including a modernized pavilion and western gardens that stand together with more traditional buildings from the 16th century. In addition to being beautiful, however, this strange mixture of architecture is also a reflection of the turbulence of Korean history. At the palace’s rear garden sits a Romanesque pavilion, Jeonggwanheon Pavilion, designed by Russian architect Aleksey Seredin-Sabatin. This space, along with the rest of the palace grounds, are beautiful all throughout the year, making it one of the most romantic spots in the city – it isn’t uncommon to spot couples walking hand-in-hand around Deoksugung Doldamgil, the stone wall that protects the grounds. If you are lucky, you can witness the changing of royal guards at Daehanmun, the front gate. EAT> At Namdo Shikdang (T. 02-773-7888) you can grab some of the best chueotang (loach soup) in Seoul. Try Ahaabah Braka (T. 02-753-7003, www.ahaabah-braka.co.kr) if you’re in the mood for fine Italian dining. Visit Deoksujung (T. 02-755-0180) and try some budae jjigae, spicy stew with sausages, ramyeon and kimchi. 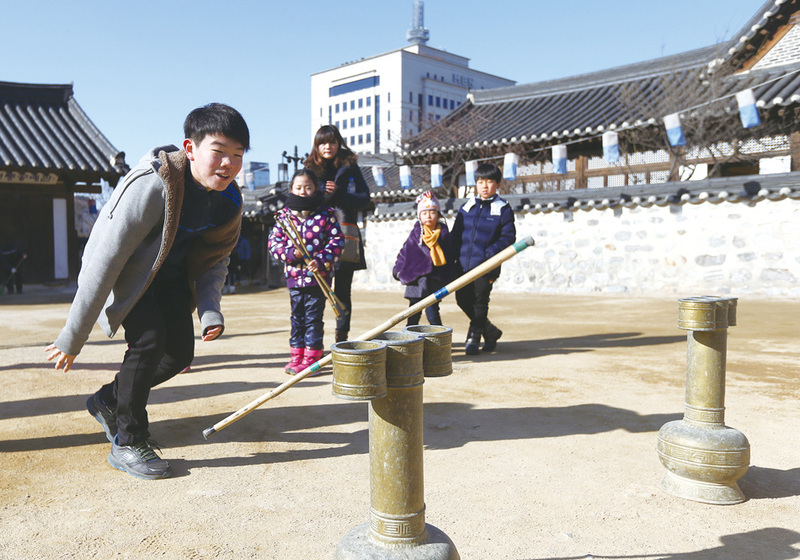 SEE> Visit Jeongdong Observatory, located on the 13th floor of the Seoul City Hall Seosomun Annex (T. 02-120), to get a panoramic view of Deoksugung Palace and its vicinity. The observatory also has a fair trade café called Café Tterak (T. 02-6361-3977). You can also admire the works of Italian artist Giorgio Morandi at the National Museum of Modern and Contemporary Art, Deoksugung (T. 02-2188-6114, www.mmca.go.kr). Pil-dong, where Namsangol Hanok Village is located, was once a famous vacation spot during the Joseon Dynasty (1392-1910) because it provided a superb view of the city. Five hanok, or Korean traditional houses, that used to be scattered around different parts of the city were relocated to this area in 1993, carefully disassembled, transported and reassembled over the course of four years. As is the case with Korean design of the past, the five houses, pond and pavilion were all arranged in a way that complements the natural landscape of the area. EAT> Complete your experience of traditional Korea by sampling the historic court cuisine of the Joseon Dynasty at Korea House (T. 02-2266-9101). The restaurant is headed by a culinary powerhouse designated as an Important Intangible Cultural Property for her artisanship in Korean court cuisine, chef Han Bok-ryeo. If that’s not enough, remember that you are near Myeong-dong and Chungmuro, where you’ll have access to a plenty of other good eats. DO> Outside of strolling through the village and admiring the neighborhood’s elegant traditional architecture, you can stop by the Seoul Millennium Time Capsule that was buried in 1994. Visitors can also partake in special programs and performances during Lunar New Year. The village has its own performing arts center, the Seoul Namsan Traditional Theater (T. 02-2261-0512), that gives traditional dance performances all throughout the year. Korea House also has one of the best souvenir shops in Seoul, where you can purchase authentic craftwork made by local artisans. GO> Chungmuro Station 충무로역 (Line 3 or 4), Exit 4. Make a U-turn at Exit 4 and you should come to a five-way intersection. Walk up the road between Holly’s Coffee and GS25, and you should be at the entrance of the village. Somerset Palace is an excellent place to stay if you’re exploring the vast Gangbuk area on the northern side of the Hangang River. The hotel is conveniently located in the neighborhood surrounding Gwanghwamun Plaza – the heart of Seoul – and is within walking distance of all Five Grand Palaces and many international embassies. In fact, on the top floor of the hotel, visitors can get a spectacular view of Gyeongbokgung Palace and the Blue House. The hotel also serves as a luxurious residential suite for any visitors looking to arrange a long-term stay in Seoul. EAT> Bärlin (T. 02-722-5622), located on the first floor of the hotel, is known for its selection of great beer and authentic Bavarian specialties prepared by a German chef. The second floor of the hotel features Sushi Hyo (T. 02-730-5396), which serves delectable Japanese cuisine. DO> The National Museum of Korean Contemporary History (T. 02-3703-9200, www.much.go.kr) exhibits thousands of artifacts from Korea’s modern era. 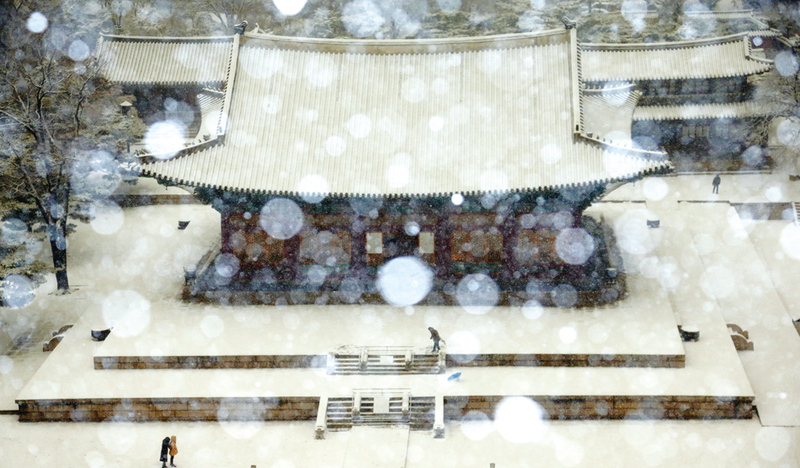 At Jogyesa Temple(T. 02-768-8600, www.jogyesa.kr), you can experience Korea’s Zen Buddhism. GO> Anguk Station 안국역 (Line 3), Exit 6. Walk straight and cross the street at the three-way intersection. It’s only been a few months since the Korean-Japanese conglomerate Lotte Group opened its highly anticipated Lotte World Tower & Lotte World Mall. Lotte World Tower is a super-skyscraper reaching up to 555 meters in height, built with the goal of becoming a major landmark in Asia. Although the upper parts of the building remain in construction, once the structure is completed in October 2016, the tower will have 123 floors and will be the tallest building on the Korea Peninsula. Lotte World Mall is a separate complex that is partially connected to the tower. 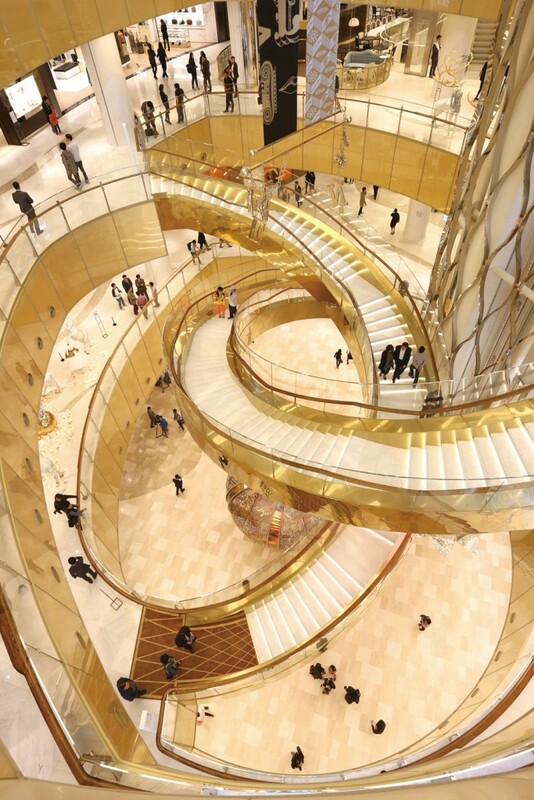 The mall is a one-stop shopping center that aspires to provide unprecedented services to its patrons – and succeeds: Lotte has placed all of its shopping and entertainment branches in the building, from the Lotte Cinema for cinephiles and the Lotte Duty Free Shop for traveling shoppers to the Lotte World Aquarium for families with children and Avenuel for shoppers looking for luxury goods. In total, nearly one thousand brands are available within the well-designed shopping complex. EAT> Australian restaurant Bills (T. 02-3213-4185) offers the best scrambled eggs and hotcakes. For something more Korean, stop by Nonhyun Samgaetang (T. 02-3213-4537), a restaurant specializing in ginseng chicken soup with 20 years of tradition and fame in Gangnam. Be sure to check out Ogada (T. 02-3213-4527) on the seventh floor to try some medicinal herbal teas that are not only pleasing to the senses but will also give you an energy boost while you shop. GO> Jamsil Station 잠실역 (Line 2 or 8), Exit 1 or 11.